You see? YOU SEEEE?!? 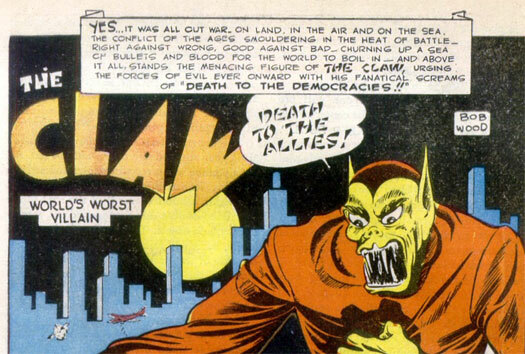 The Skrulls were already on top of things back then! Defeat the New World Order! I challenge The Claw to a no-power-moves-barred flaming adamantium steel-cage deathmatch live on pay-per-view this Halloween!! For Justice!! He’s got phlegmmings, too! But you better get your death match in quick, Jose, it looks like The Claw (World’s Worst Villain) is in the middle of a massive heart attack. “World’s Worst Villain”? I agree. At least he’s only clutching his chest for eating too much ham. Imagine what the panel would look like if he hadn’t gotten his fiber! Whose allies? Hopefully not his own, eh? One would think it prudent to specify whose allies are to be put to death, lest foolish underlings bungle things up, as is their wont. Tell Vince McMahon that ‘pre-existing conditions’ do NOT make this match forfeit! What? What’s with the paddles, Ref? What? No! NOOOOOO!! It’s just heartburn from that bag of pork rinds, man! Quit playing possum and GET UP, Claw! No! Noooo…! I didn’t know Glen Beck had his own comic book. Do you think that the Axis powers really referred to their enemies as allies? He may be the world’s worst villian, but, he broke the Guiness Book of World Records for holding a Rubick’s Cube in his mouth for sixteen years.